Nowadays, many people are used to enjoying and watching videos/movies on their iPhone, Android phone, iPad, iPod, Kindle, PS4, Xbox one and others. But we should know these devices all have strict restriction on input video formats, then you will come cross the situation that some of videos can't be played on your devices. So video converter is necessary in our daily life. But how to find out a best video converter which fully supports all video formats and provides fast speed and good video quality? Don't worry. This page will list top 5 video converter for your reference. Video Converter Ultimate is a professional and complete video toolbox which features video conversion, video editing, video downloading, DVD burning, video playing and screen capturing. You will never get a converter that is easier to use and more powerful than Video Converter Ultimate. For video conversion, it supports all major audio and video formats as well as ready preset for a variety of devices. Better still, the conversion speed and video quality are awesome. • Feature an intuitive interface to make steps easier. • Support over 150 common video/audio formats including 4K UHD. • Provide 30X video conversion speed with four hardware accelerated technology (Intel QSV, NVIDIA CUDA/NVENC and AMD). • Enable multiple CPU cores (up to 4) and multi-threading to make conversion more smoothly. • Support DVD burning and DVD menu customization. • Transfer converted videos to other devices via Wi-Fi. Any Video Converter Ultimate is well known for its versatility, easy to use and a wide range of video formats. It can convert all major videos like MP4, AVI, MKV, FLV, AVCHD and DVD to another format as well as common smartphone, tablets, game consoles, etc. Additionally, this program offers a wealth of features such as burning DVD, editing video, and downloading online videos. • Support over 200+ video/audio formats. • Convert DVD&CD and burn videos to DVD disc. • Provide three versions: free, pro and ultimate to cater different user needs. • Take a little long time to converting with only NVIDIA NVENC acceleration. 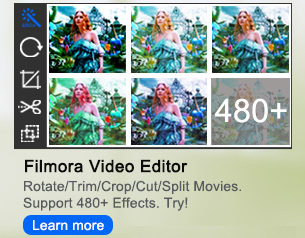 • Do not support 3D video conversion. It is a professional video converting solution that comes with the ability of converting almost all video/audio formats, removing copyright protection and ripping DVD and Blu-ray disc to most video formats. Also as a video editor, you are allowed to trim, merge, crop, split video, add external subtitle and watermark as your need. • Act as a professional video converter. • Do not support DVD/Blu-ray burning. • Do not have too much extra function. • Take long time to converting and ripping. Aiseesoft Video Converter is also a preferable alternative which enables you to convert videos from various video/audio formats and also supports lots of output formats. And you are able to enhance the video quality, rotate/flip your video angle and do some other editing with the new version released recently. It also allows you to download videos from several websites such as Metacafe, Yahoo, YouTube and Vimeo. • Support HD, 4K video conversion and DVD conversion. • Offer some basic video editing features. • Download videos from video sharing website. • Extract audio tracks from DVDs and video files. • Cannot burn converted videos onto DVD. Xilisoft Video Converter Ultimate is a software available for both Mac & Windows which helps you to handle most, but not all, video and audio file types. Another attractive feature is that you can also do a small amount of editing like clipping, merging, or splitting a video within the program. Unfortunately, the stability and performance of the software are up to par so it maybe not the best recommendation for personal use. • Support more than 160 video and audio formats. • Allow to convert 3D and HD videos. • Offer support for APE, CUE, and audio CD burning. • Have a complex interface. • Do not Support DVD burning. • Come with poor customer support. • Occur crash when work with large videos. According to the introduction, all the video converter we mentioned above can meet the demand of primary video conversion. However, every software program has its advantages and disadvantages. Now I believe that you know which one is the best choice for you. And I would like to recommend Wondershare Video Converter Ultimate relative to prices and functions.